From a water perspective, we live in a 'world of Cape Towns'. That was the banner of the 2018 Water Week edition of Down to Earth, the signature publication of the Centre for Science and the Environment (CSE), India. The publication had its global launch when the water practitioner community gathered in Cape Town at the biennial Water Institute of Southern Africa congress in June. The special edition magazine was explicit on a few pivotal issues. Firstly, it offered an external analysis of the severity of the extended drought episode we have gone through on the back of the 2014 El Nino event. Secondly it illustrated once again the class diversity of the water scarcity experience in South Africa; in particular the middle-class inconvenience dominated the media coverage, masking the real threat of socio-economic stagnation on the one hand, and a missed opportunity to highlight the dire need to bring servicing to the poor and vulnerable in South Africa on the other. The third is the world-wide nature of the challenge. Ten metropolitan cities of the Global South are on the very edge of water crisis. These are Sao Paulo, Buenos Aires, Mexico City, Sanaa, Karachi, Kabul, Beijing, Bengaluru, Istanbul, and on our own continent, Nairobi. In addition to these, there are 200 cities in the world that are considered water stressed. 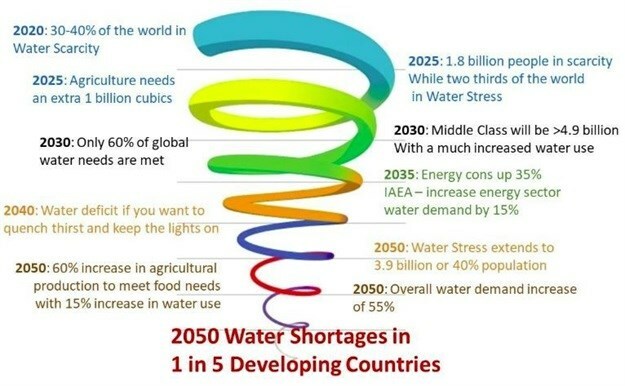 When one looks to the predictions of the future, as illustrated in Figure 1 (below), we see a spiral with a 2050 end point of one in five developing countries experiencing water shortages. The convergence of the predictions shows that a combination of a much larger population with increased longevity, further economic growth as the developing world catches up with the developed world, increasing consumption patterns, partnered with the impacts of climate change and increasing pollution levels, will see a global water-stressed future. Figure 1: Different scenario and forecasting exercises, using the assumption of the continuation of current practices is a business-as-usual paradigm converge on concomitant and increased pressure on our resources. This is turn compromises water, energy and food security with knock-on effects on health, security and stability. Importantly, and in addition, there will be a concomitant stress in both sustainable power access, as well as food security. We have the added challenge of these sectors working very separately in response to these joint challenges. Silos, as we know, are only good for temporary storage. Was the water shortage caused by farmers, city dwellers or drought? The Water Research Commission has through its Water-Energy-Nexus Lighthouse programme, and together with its partners, built an important repository of new knowledge in this domain. It has also developed the beginnings of a scientific community of practice to engage both the challenge and the possibility of a future that is characterised by water, energy and food security, driven by a nexus approach. The W-E-F nexus approach means a joint consideration of water, energy and food security contexts and objectives in developing solutions and interventions that are designed purposefully to have collective and individual positive outcomes across the three sectors. This is geared toward creating a critical mass of capacity and resources to achieve higher levels of both security and delivery of water and water services, sustainable energy and food access and security throughout the system. What can other cities learn about water shortages from 'Day Zero'? We, the water science community, have over the years, with a water lens, piloted and demonstrated many nexus solutions like new sanitation, energy-generating wastewater treatment processes with added benefits in the form of chemicals and fertiliser beneficiation for agricultural production. The additional benefit is that these solutions are strongly in line with the sustainable development paradigm with the deliberate goal of a lower carbon budget compared to traditional processes as a stated objective for each of these interventions. The new climate change legislation seeks to achieve a new industrialisation paradigm as a pivotal contribution to the New Dawn project. The scale-up and roll-out of the suite of water-energy-food nexus solutions has to be a keystone to this strategy. In the words of Sunita Narain, the director-general of the Centre for Science and Environment, “Cape Town, Bengaluru and Chennai, all have a common present. 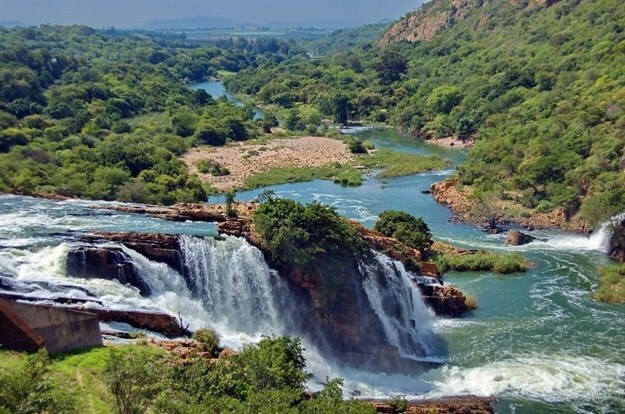 The question is if they can create a new future that is water secure because it is water wise.” The optimised path to this prosperous future can only be one of joint water, energy and food security through a coordinated and synergised approach. Dhesigen Naidoo is CEO at Water Research Commission. By Ana Rita Sequeira et al.